In 2002, the finances of the state’s public libraries were negatively affected by state and local budget cuts. A 2003 Fast Facts from LRS showed that library districts weathered these fiscal cuts better than non-district public libraries. The average local revenue of libraries which were not part of a library district decreased from the previous year. On the other hand, public libraries which were part of a library district actually saw an increase in their average per capita funding. There have been four years of data collection between the dramatic fiscal changes of 2002 and today. 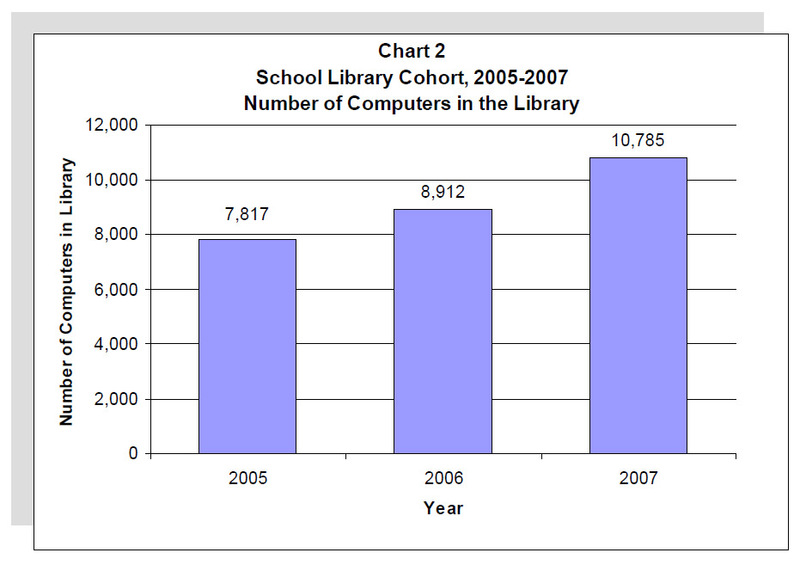 How have library districts fared between 2002 and 2006? Have they continued to show strong financial stability? How do they compare to their non-district counterparts? 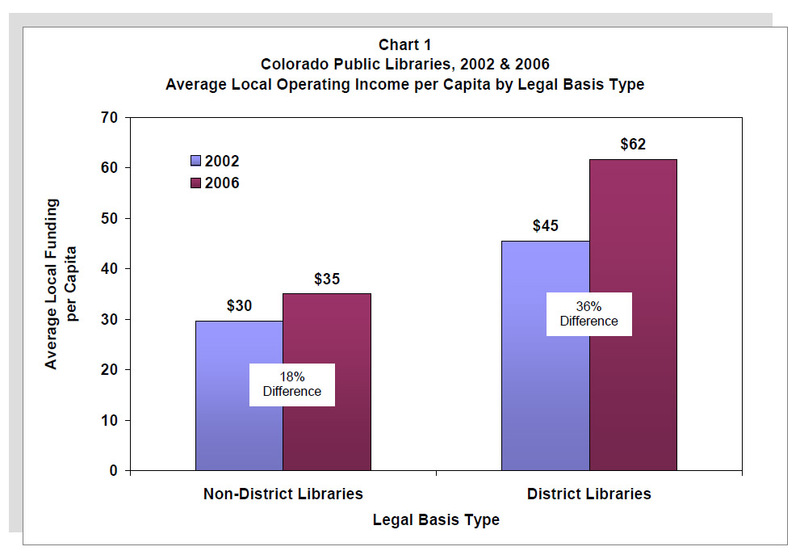 An examination of the change in percentage of average local operating income per capita between 2002 and 2006 reveals that both library districts and non-district libraries have increased their local income (see Chart 1). 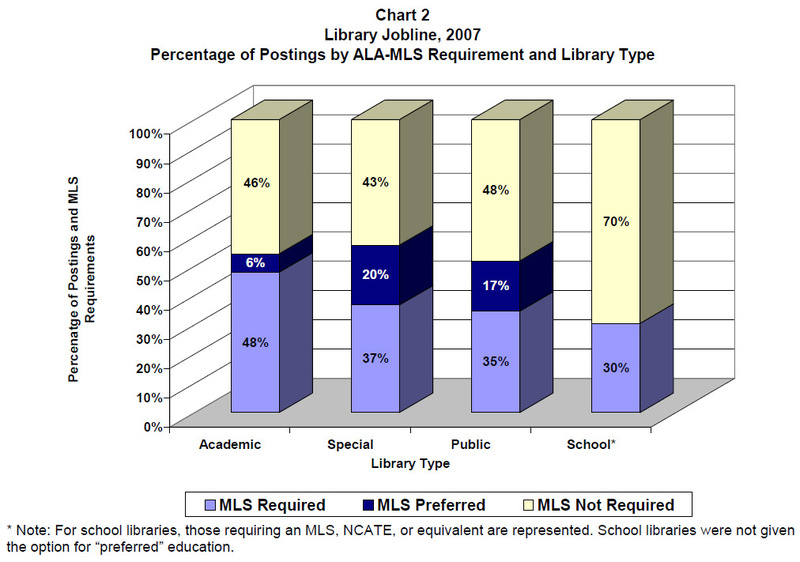 However, the percentage change for library districts is double that of non-district libraries. This is not too surprising given the stable, dedicated funding library districts tend to enjoy. So, do these libraries with increased inputs—in the form of funding—also have increased outputs? In other words, if library districts have increased their funding more than non-district libraries, have they also increased the utilization of their resources and materials more than the other library types? 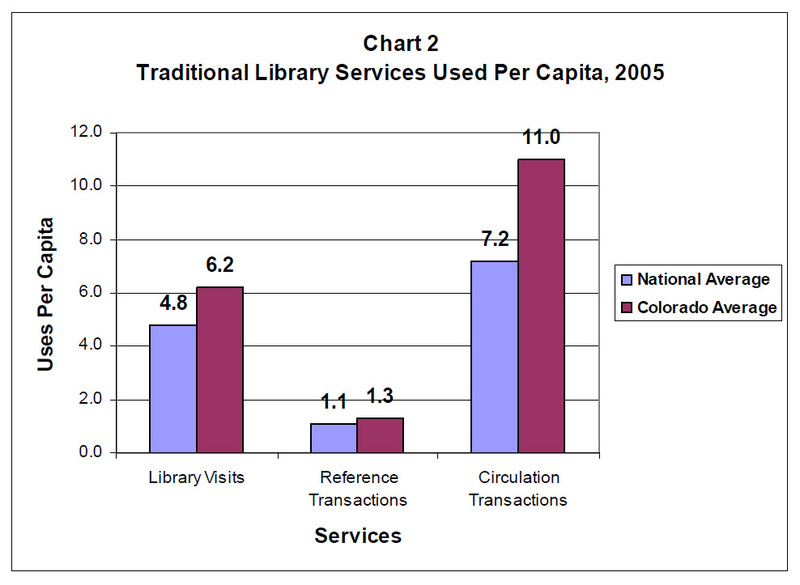 An examination of library visits per capita, circulation per capita, and program attendance per 1,000 served was performed for 2002 and 2006 to determine if patron usage had changed during this time (see Chart 2). Between library districts and non-district libraries, the most dramatic difference in percent change comparisons was for program attendance. Library districts had an increase of 43 percent in average program attendance per 1,000 served between 2002 and 2006, while non-districts had only a 9 percent change. Both library district and non-districts saw growth in the average number of library visits per capita in 2006 compared to 2002. Library districts had a 31 percent increase in visits compared to 19 percent for non-district libraries. Although the percent change in average circulation was not as dramatic as library visits, both library types witnessed an increase in their circulation per capita. 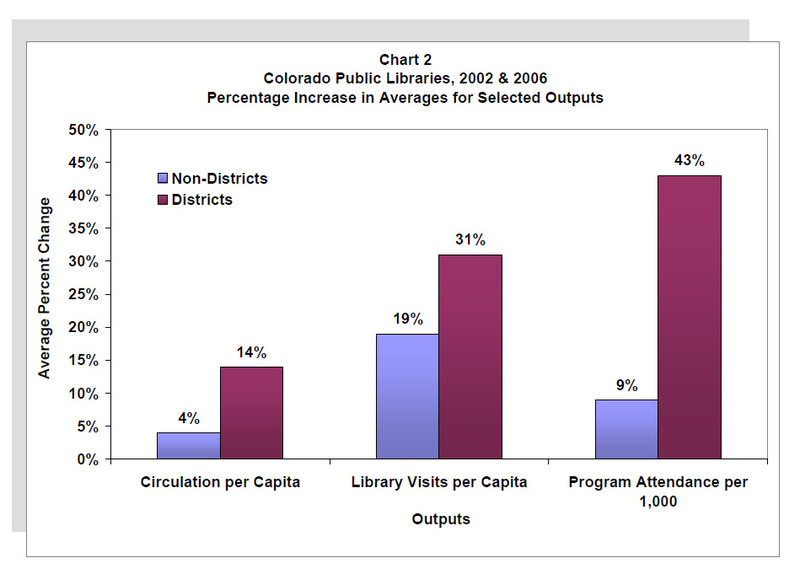 The percentage change between 2002 and 2006 for circulation in library districts was nearly 4 times higher than that of non-district libraries (14% vs 4%). Library districts and non-district libraries have been able to rebound from the 2002 budget cuts with financial and community strength. 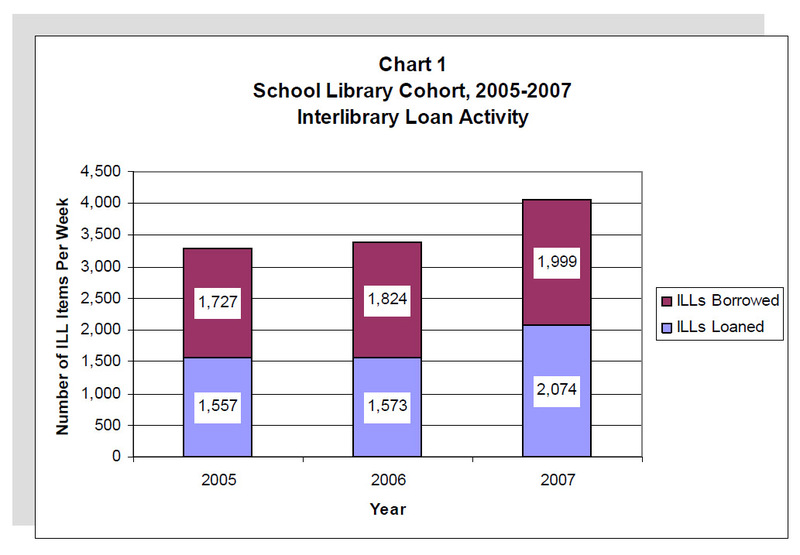 Both library types have seen increases in their local funding and in their outcome measures. However, library districts have seen a greater increase in their funding which may be attributed to their autonomous nature. This stable funding has allowed library districts to increase their outputs as well. Library districts are not only more supported financially than their non-district peers, the populations they serve are entering their doors more often and utilizing their services more frequently. Lietzau, Z. (2003). Fast Facts: Colorado Library Districts Thrive While Other Library Types Face Big Cuts. Library Research Service, Colorado State Library. http://www.lrs.org/documents/fastfacts/193_nonfunding.pdf. Bolstered by these endeavors, numerous library jurisdictions around the state, both large and small, have expanded the depth and scope of their programming for children from birth to age 6. Such programming includes ECRR-based literacy enhanced storytimes (for children and their adult caregivers)4 and adult-only ECRR workshops that provide early literacy research data and hands-on skill-building activities adults can use with children. 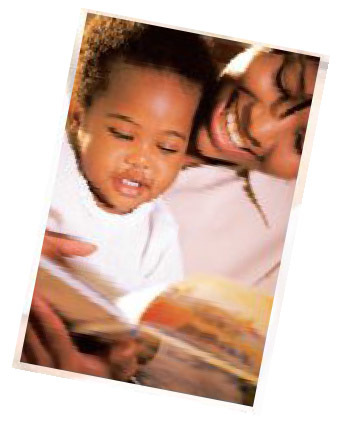 One goal of both programming types is to help adult caregivers understand the roles they can play in the development of children’s reading readiness. Among the outgrowths of CSL’s initiative thus far, a task force called Colorado Libraries for Early Literacy (CLEL) came to fruition in January 2008; it now serves as an advisory group to CSL. Comprised of self-selected active early literacy providers from public libraries across the state, CLEL aims to strengthen children’s literacy through a combination of library services and community advocacy. The CLEL Steering Committee currently includes children’s services, training, and outreach staff from 13 different Colorado library jurisdictions. This report provides baseline early literacy programming data from these 13 library jurisdictions. 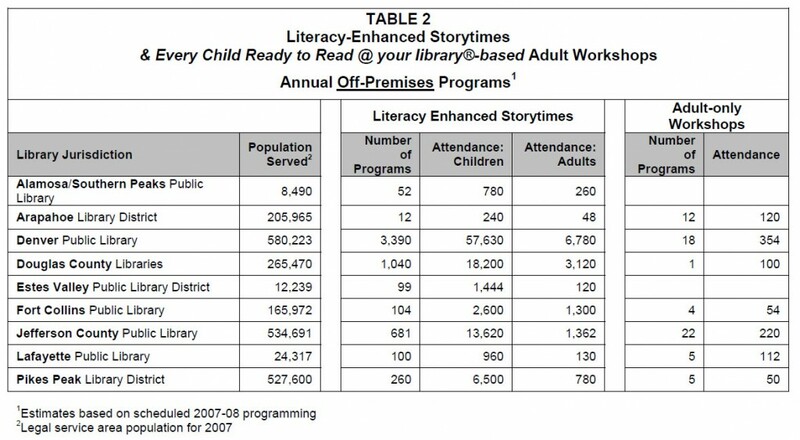 The data was collected by CSL from February through May of 2008 from people who provide early literacy services on behalf of these libraries. The numbers represent best estimates based on current and previous years’ activities as reported by those library personnel. The data itself is divided into two different tables based on programming location—in-house or off-premises (outreach). 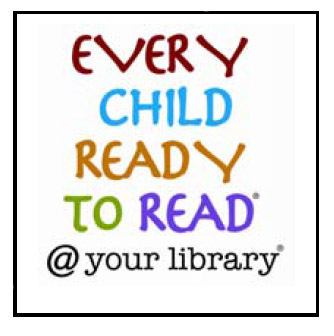 ECRR-based literacy-enhanced programming is offered in communities of varying sizes around the state. Using 2007 figures, the 13 public library jurisdictions surveyed for this report range from “medium-small,” Alamosa/Southern Peaks Public Library (8,490), to the state’s largest, Denver Public Library (580,223). 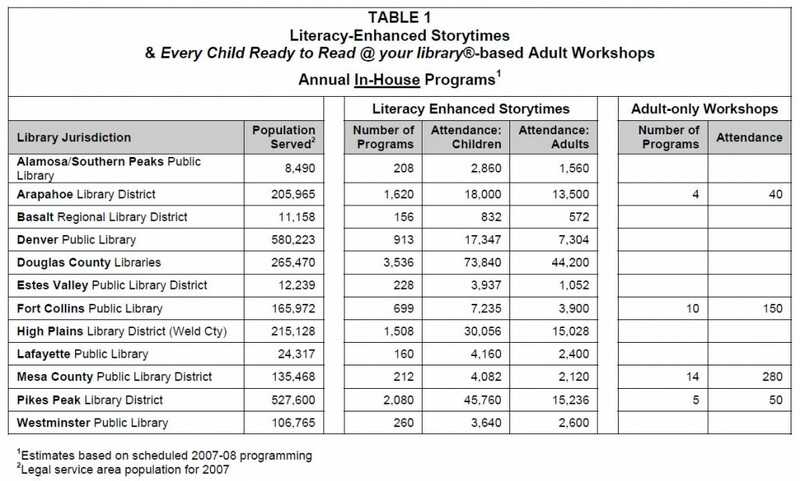 For 11 of these 13 library jurisdictions, in-house literacy-enhanced storytimes are the most prevalent of these types of programs. Table 1 looks at the numbers of programs and attendance figures per year for activities held on the library premises. It should be noted that some libraries host programs for community partners such as child-care groups or clients of social service agencies inside their libraries as well as off-premises. Literacy theme for the storytime, using at least 1 of the 6 pre-reading skills. Parents and/or caregivers invited to attend. Storytime leader models and communicates about early literacy skills. Selection of appropriate books/activities to promote use of a skill. Sharing of skill-oriented information by leader either verbally or with handout material. In-House Literacy-Enhanced Storytime Programs: Nearly all of the libraries, 12 of the 13 jurisdictions, offer this type of programming. Session numbers per year range from 156 at Basalt Regional Library District to 3,536 at Douglas County Libraries. Child visits range from 832 (Basalt) to 73,840 (Douglas) per year. Adult visits per year range from 572 (Basalt) to 44,200 (Douglas). In-House Adult-Only ECRR Workshops: Just under a third of the 13 libraries offer these workshops for a general parent/caregiver audience. 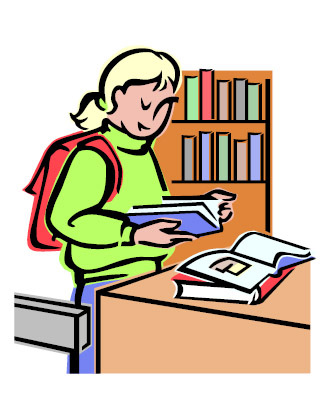 Where offered, the frequency of these programs ranges from 4 (Arapahoe Library District) to 14 (Mesa County Public Library District) times per year. Estimated adult visits per year range from 40 (Arapahoe) to 280 (Mesa). Mesa provides their 14 workshops as part of a community partnership that serves teen moms. Beyond the programming statistics shown in this table, several libraries provide special in-house adult ECRR workshops for specific constituencies including library volunteers and members of community groups not necessarily representative of a parent/caregiver audience (e.g. students seeking academic credit). While such programs serve to benefit children and adults in these communities, statistics for these specialized-audience in-house adult ECRR workshops are not covered here. Table 2 looks at programs and attendance figures per year for activities provided by libraries at off-site venues (outreach). 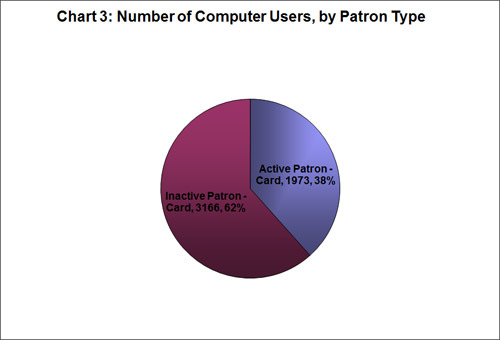 In some cases, these numbers represent outreach programming led by closely supervised library-trained volunteers. Off-premises programs frequently reach adults and children who might not otherwise avail themselves of public library services. Often, these are geared toward specific groups at specific locales such as a prison or a child-care facility. Off-Premises (Outreach) Literacy-Enhanced Storytime Programs: Nine of the 13 jurisdictions offer this programming. Where available, annual session numbers range from 12 (Arapahoe Library District) to 3,390 (Denver Public Library). Child visits range from 240 (Arapahoe) to 57,630 (Denver) per year. Adult visits per year range from 48 (Arapahoe) to 6,780 (Denver). Frequently, off-premises storytime programs are held in child-care environments where the ratio of children to adults tends to be higher than comparable statistics for in-house programming. Off-Premises Adult-Only ECRR-based Workshops: Seven of the 13 jurisdictions offer these workshops for a general parent/caregiver audience. Where available, the frequency of program offerings ranges from 1 (Douglas County Libraries) to 22 (Jefferson County Public Library) per year. Estimated adult visits per year range from 50 (Pikes Peak Library District) to 354 (Denver Public Library). The Colorado State Library collected these statistics to provide baseline knowledge about public library-based in-house and off-premises programming—both for children and for their adult caregivers—focused on children’s reading readiness. The data from these 13 library jurisdictions who have staff members serving on the CLEL Steering Committee provides us with a useful overview for understanding several common types of early literacy programming currently underway—as well as the frequency of and attendance at those activities. In Colorado, such early literacy program offerings are not limited to these 13 libraries; other public libraries around the state enthusiastically provide these kinds of programs, too. Future collection of statistics will enable CSL and CLEL to better understand the availability and impact of early literacy activities. Through training, advocacy, and ongoing support, Colorado’s libraries are working collaboratively to foster and promote early literacy to benefit residents in all areas of the state. 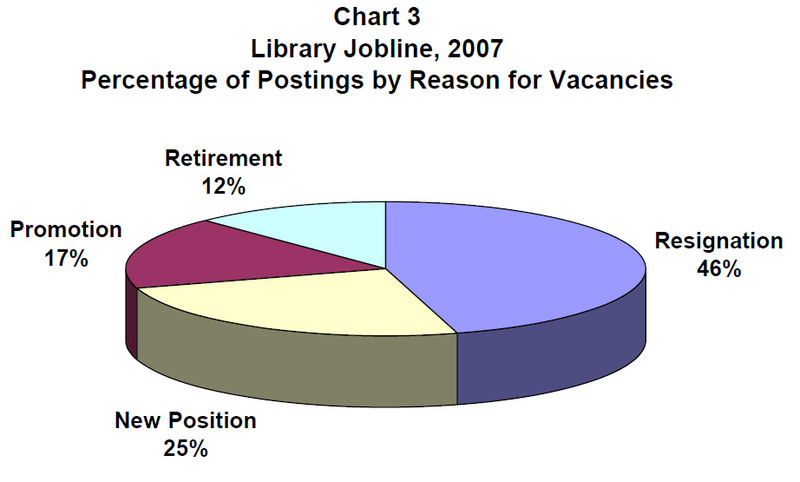 Of all library types, public libraries posted the most job openings on Library Jobline with nearly 2 out of 3 listings (61%). 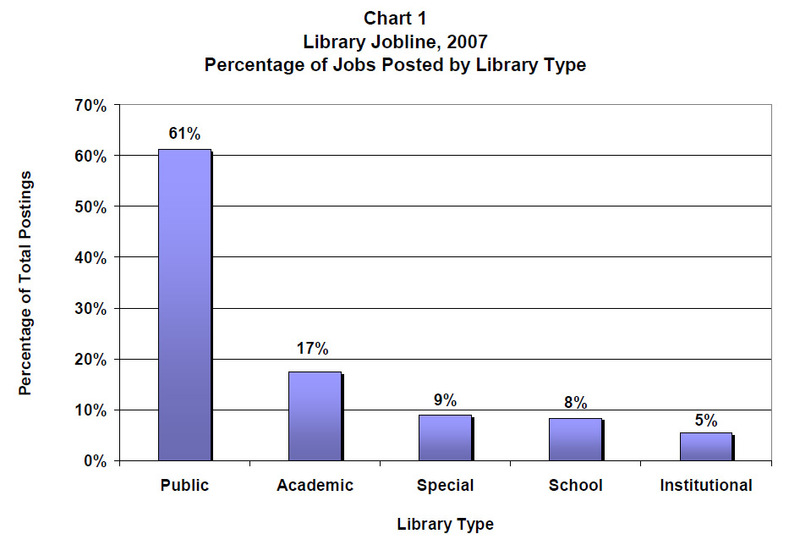 This is not particularly surprising, given that public libraries employ more staff than any other library type.5 Academic libraries were a distant second with fewer than 1 in 5 of the jobs posted (17%), followed by special (9%), school (8%), and institutional (5%) libraries. Seven postings indicated more than one library type (see Chart 1). Released in November 2007, the 2005 NCES Public Libraries in the United States survey report shows that Colorado libraries have positively responded to changing information needs.9 For example, public libraries in Colorado collected audio-visual materials at a rate significantly higher than the national average; in 2005 they held 21 percent more audio materials per 1,000 people served, and 36 percent more video materials per 1,000 than the average U.S. library (see Chart 1). AskColorado, the statewide 24/7 free virtual reference service that started in September 2003, is a collaborative project among libraries of all types throughout the state. Through the efforts of over 350 librarians from public, academic, school, and special libraries, the service provides online answers to Coloradans—any age, anywhere, anytime. Since its inception, AskColorado has steadily increased both in number of user sessions and customer satisfaction levels. 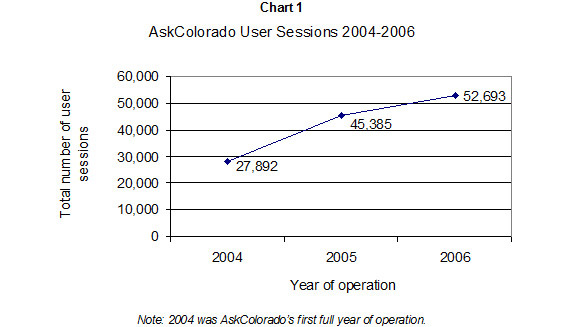 According to AskColorado usage statistics, the number of user sessions increased substantially during the first 3 full years of service (see Chart 1). 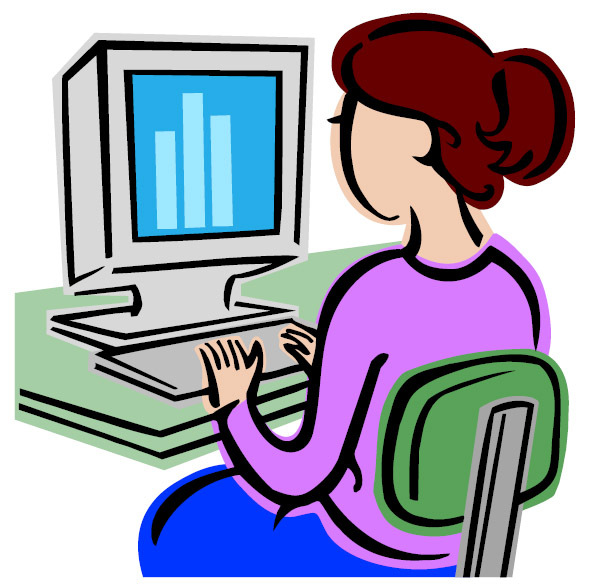 In 2006, AskColorado librarians answered questions during more than 52,000 online reference sessions—almost twice the number of sessions as in 2004 (27,892). 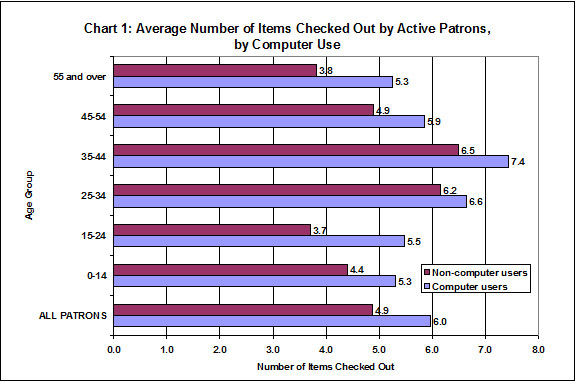 Findings from both the 2005 and 2006 surveys indicate a majority of respondents found the virtual librarian helpful and were satisfied with the answers to their questions (see Chart 2 and Chart 3). In 2006, 3 out of 4 respondents (74%) found the virtual librarian to be helpful, and a similar proportion expressed satisfaction (72%) with the answers they received from the AskColorado librarians. This represents a significant increase from 2005 to 2006 in the customer satisfaction with the service. To measure AskColorado’s success serving its patrons, an annual customer service and outcome based evaluation survey was created to ask a sample of users for their reaction to the service. In 2004, following the first year of service, two surveys were administered to users of the service; a pop-up customer satisfaction survey and an outcome survey e-mailed to those who agreed to take this follow up survey. The outcome survey also contained demographic questions. The two surveys were revised and condensed in 2005 to create one pop-up exit survey. Therefore, the data comparisons in this Fast Facts contain only 2005 and 2006 information. In both the 2005 and 2006 survey respondents were asked to indicate the outcome(s) of their visit to AskColorado (see Table 1). The same 5 outcomes top the list each year, with research for homework or a school project having the strongest showing overall (ranking first in 2006 and second in 2005). Similarly, identifying a new source of information rose from 2005 to 2006. Obtaining a specific fact or document was the number 1 outcome in 2005 and fell to third in 2006. Obtaining information for work and learning how the library can help respondents were the fourth and fifth most popular outcomes, respectively, in both years. Respondents were told to choose all outcomes that applied. Therefore respondents could choose more than one answer. 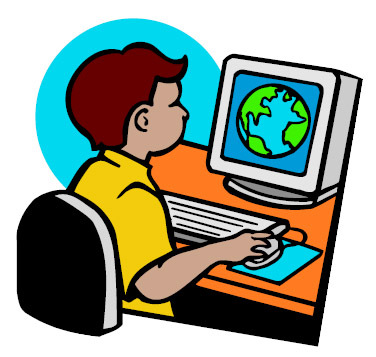 Between 2005 and 2006 survey respondents were increasingly using the AskColorado virtual reference service in order to conduct research for homework and school projects, as well as other traditional reference services. The increase in usage of the service, as well as a rise in customer service ratings, indicates that AskColorado is growing in both popularity and customer satisfaction. French, J. (2007). 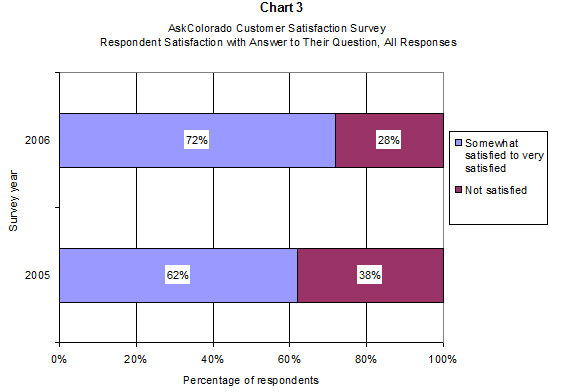 2006 AskColorado Customer Satisfaction & Outcome Survey. Library Research Service Colorado State Library. According to the American Library Association, a challenge is “an attempt to remove or restrict materials, based upon the objections of a person or group . . . thereby restricting the access of others.”11 The Library Research Service annually collects data on challenged materials as part of the Colorado Public Library Annual Report. 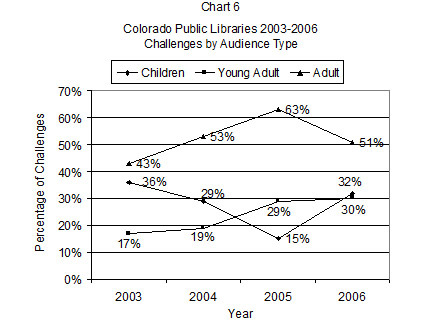 In 2006, out of the 115 public libraries in Colorado, 23 reported that they received a formal challenge during the year. There were a total of 89 individual challenges to books, materials, events, exhibits, and Internet-related services in the state’s public libraries. Challenges to Internet content or access policies are reported separately from materials and event challenges. There were 63 challenges to materials and events. This was the lowest number of challenges to materials and events since 2003 (see Chart 1). 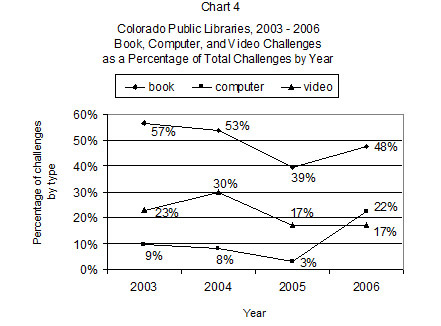 In 2006, 6 Colorado public libraries reported challenges to Internet content or access policies. A total of 26 individual challenges were reported. This is nearly 4 times the number of Internet-related challenges reported in 2005. A follow-up survey was sent to all 23 libraries who reported a formal challenge. This survey requested the title, author, format, reason for the challenge, action taken by the library, and the date of the publication or incident regarding each challenge. 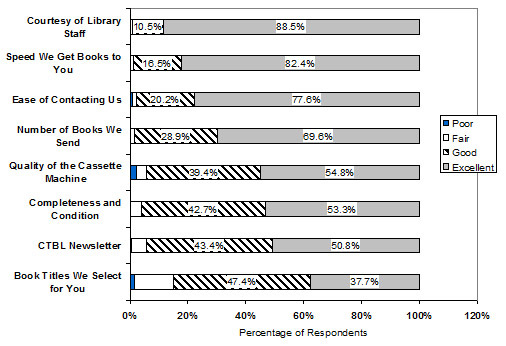 Twenty of the 23 libraries responded to the follow-up survey. The follow-up survey received detailed information for 49 challenges to books, materials, events, and exhibits. Of these challenges 40 (82%) resulted in no change being made by the staff regarding the location, availability, description, or classification of the item (see Chart 2). Seven items (14%) were moved to another part of the library or reclassified. The action was dropped by the individual who filed the challenge in 1 case (or 2%). Of the 26 Internet-related challenges reported in the Public Library Annual Report, the follow-up survey received information for 13 challenges. Six cases resulted in no change, in three cases the action was dropped, and in 2 cases the Internet-related matter was restricted. For the remaining 1 case, the reporting library chose other for the action but did not provide more detailed information. Following the trend of the previous years, books were the most challenged format in 2006 according to the result of the follow-up survey. 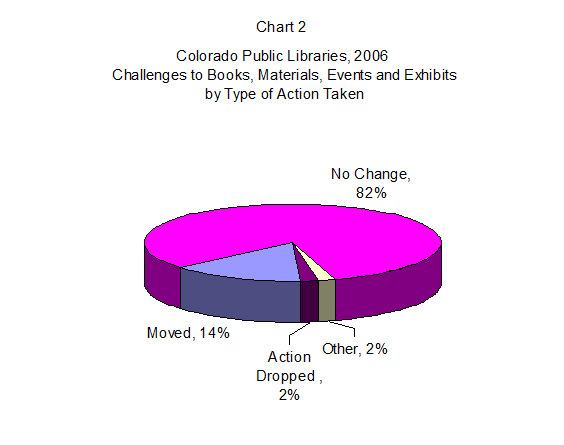 Almost half (47%) of all challenges in Colorado public libraries involved books (see Chart 3). 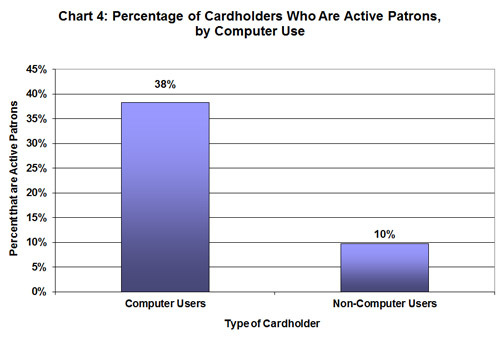 Less than one-quarter (22%) involved Internet-related services (i.e. 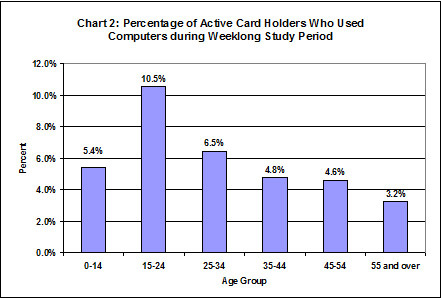 computer) and video materials accounted for less than one-fifth (17%) of the challenges. Challenges involving music CDs, periodicals, activities, and audio books together totaled over one-tenth (12%) of all challenges. 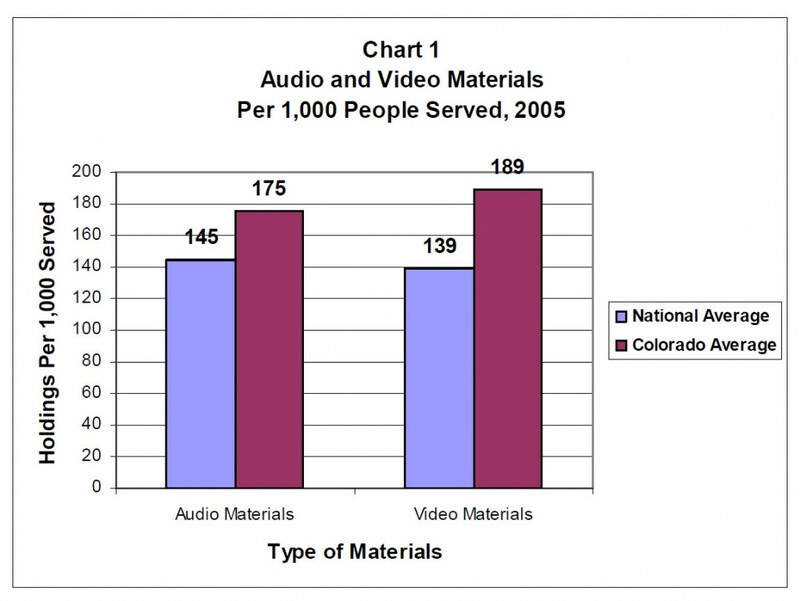 In 2004, the figures indicated a possible trend in which videos would begin to account for a greater proportion of challenged materials (see Chart 4). 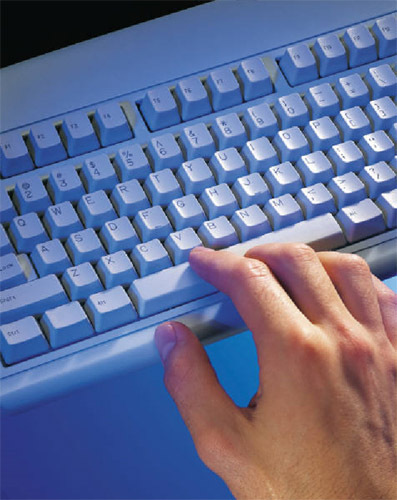 However, a more recent examination of the types of materials challenged indicated that computer (i.e. Internet-related) services are increasingly being challenged. The percentage of Internet-related challenges rose dramatically from 3 percent in 2005 to 22 percent in 2006. In spite of these fluctuations, books continue to be the most challenged format. In the follow-up survey, more than 1 audience/age group type may be chosen for each formal challenge. 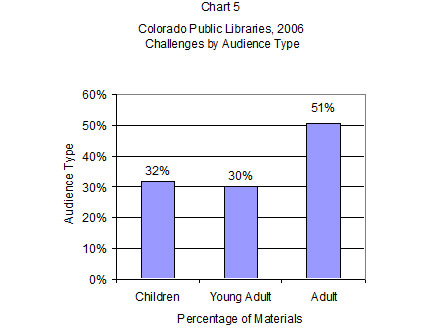 More than half (51%) of all challenges for 2006 were considered challenges to adult materials (see Chart 5). In 2006, there was only 1 more challenge to children’s materials (20) than to young adult (19) materials. Although challenges to adult materials fell from 63 percent in 2005 to 51 percent in 2006 (see Chart 6), they continue to be challenged more frequently than materials in other age categories. Interestingly the percentage of challenges to children’s or young adult materials fluctuates rather more from year to year. The proportion of challenges to young adult materials grew steadily from a low of 17 percent in 2003 to 30 percent in 2006. Whereas challenges to children’s materials went from 36 percent in 2003 to a record low 15 percent in 2005, and then rose again in 2006 to 30 percent. Responding libraries are also asked to report the patron’s reason for the challenge. Multiple reasons can be selected. In 2006, the reasons most commonly cited were due to materials being sexually explicit or unsuited for the intended age group (See Table 1). The “other” category includes reasons not listed on the follow-up survey. The remaining 61 challenges to books, materials, events, and exhibits were a variety of individual titles. 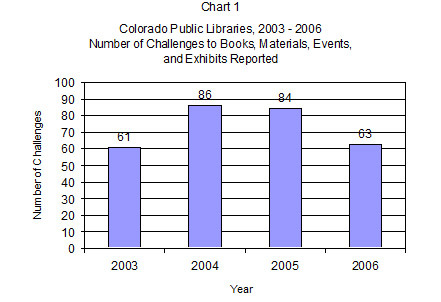 Go to http://www.lrs.org/documents/plstat06/challenges_details_06.pdf to view the entire Challenges to Materials at Colorado’s Public Libraries report for 2006.13 The challenge reports for previous years may also be viewed at http://www.lrs.org/pub_stats.php. 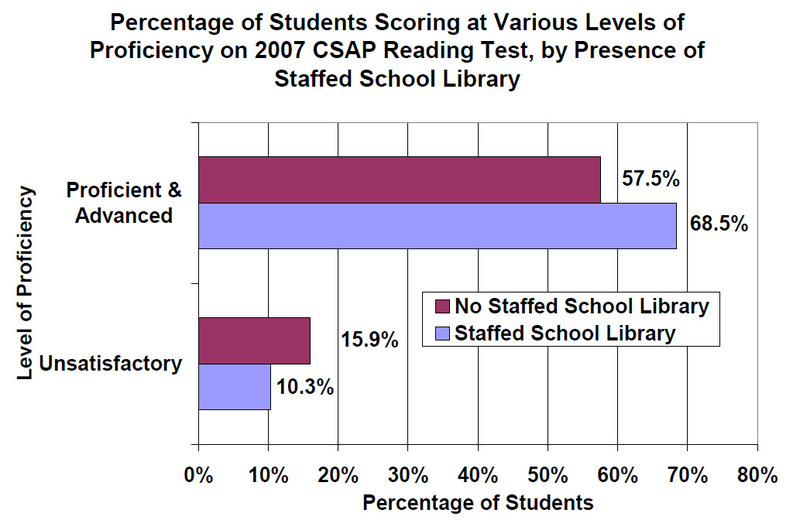 The Colorado Department of Education recently released 2007 CSAP (Colorado Student Assessment Program) test results for schools throughout the state,14 and students in schools with staffed libraries performed better on the reading portions of the CSAP than their counterparts in schools without staffed libraries.15 Schools with staffed libraries saw a higher percentage of their students score Proficient or Advanced on the CSAP reading test (68.5% vs. 57.5%). Conversely, schools without staffed libraries had a higher percentage of students score “unsatisfactory” (15.9% vs. 10.3%), compared to schools with staffed libraries (see chart below). Undoubtedly, many factors contribute to success or failure on standardized tests. There is an opportunity here for more research to better determine the role that school libraries play in the success of Colorado’s students. 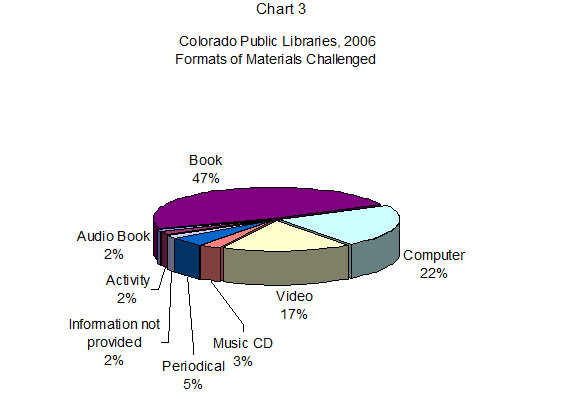 In the fall of 2006, a patron survey was developed and administered to evaluate the current services of Colorado Talking Book Library and to plan for future services.17 Patrons, Colorado residents who are unable to read print materials, in over 43 counties throughout Colorado responded to the survey. The results of this survey overwhelmingly demonstrate that these patrons consider CTBL to be an important and useful service for meeting their informational and recreational reading needs. Respondents were asked to rate how satisfied they were with a number of different CTBL services, including the overall quality of services. Virtually all respondents rated the overall quality of service as either excellent (85%) or good (15%) (see Chart 1). The Colorado Talking Book Library (CTBL) provides services, at no cost, to Coloradans of all ages who are unable to read standard print material due to visual, physical or learning disabilities. 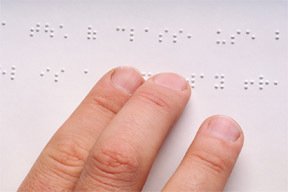 CTBL provides recorded, Braille and large-print books and magazines, as well as a small collection of descriptive videos. CTBL currently has 12,000 active patrons. CBTL is part of the Colorado State Library, a division of the Colorado Department of Education and is affiliated with the network of Library of Congress, National Library Service for the Blind & Physically Handicapped (NLS). 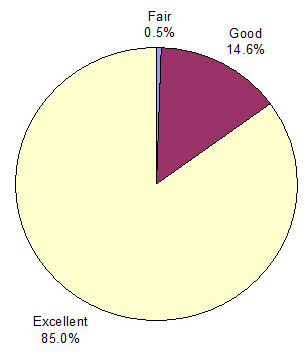 Almost all respondents (99%) rated the courtesy of library staff as either excellent or good (see Chart 2). Notably, no respondents rated it as poor. All respondents were satisfied at some level (excellent, good, or fair) with the speed and the number of books sent to them. Most respondents were satisfied (excellent or fair) with the ease of contacting CTBL (98%) and with the book titles CTBL staff had chosen for them (85%). 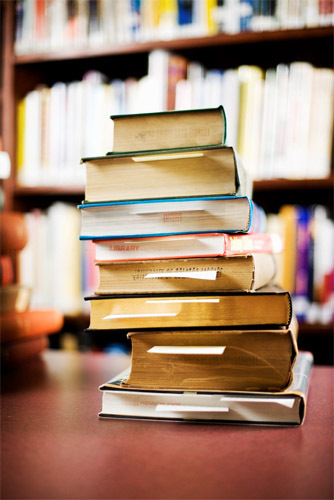 Books may be ordered via mail, e-mail, phone, fax, or online. Respondents were asked in what ways CTBL services have been of value to them (see Chart 3). An overwhelming number of respondents chose reading for pleasure (88%). This is similar to the findings from a national study, indicating “leisure reading is the most widely cited outcome” of public library patrons in general.18 More than one-third of respondents (37%) selected learning about a personal interest followed by help with staying connected to the community (10%). Included in CTBL’s collection is the material recorded by volunteers in CTBL’s recording studio. Books in this collection are by Colorado authors, about Colorado history or are of regional interest. Patrons may suggest material to be recorded, however the collection development policy on the CTBL website will apply. This collection supplements the larger collection provided by Library of Congress, National Library Service for the Blind and Handicapped (NLS). Respondents overwhelming indicated they consider the services CTBL provides to be valuable. More than three-fourths rated the overall quality of CTBL services as excellent. The CTBL also received high satisfaction ratings for the ease of contacting staff, as well as general staff courtesy.